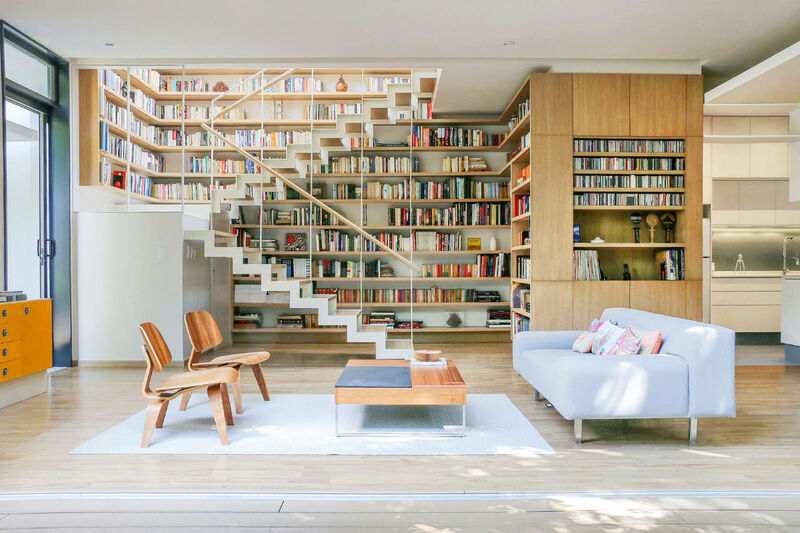 A perfect place to install a particularly towering library in an open plan living area has got to be around a staircase. The rising treads provide the perfect climb to the top of the tree of knowledge, allowing stops at each shelf along the way. 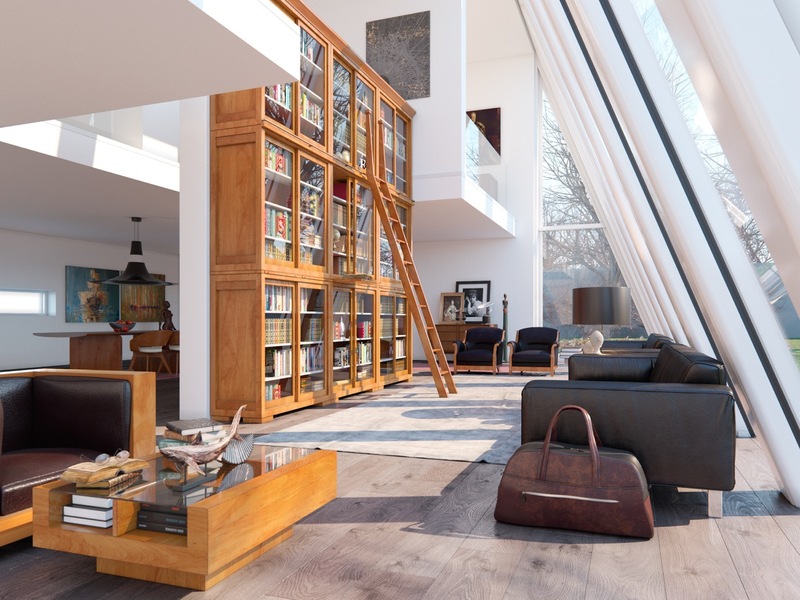 If your staircase at home is of the more traditional variety and space is at a premium, then you could still utilise the unused space beneath it for your book collection. Our living rooms are a ready made relaxation spot in which to lounge with a good book at the end of a long day, or over a lazy weekend. 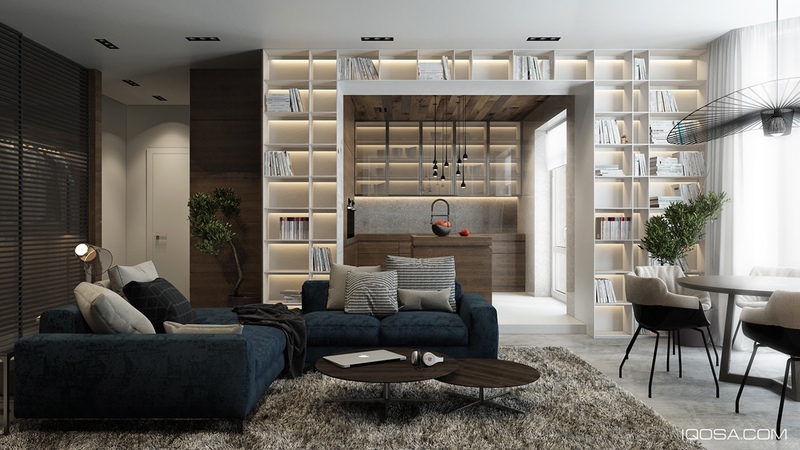 By moving a sofa just slightly away from the wall, in toward the centre of the room, ample space can be created for the installation of set of bookshelves behind it. 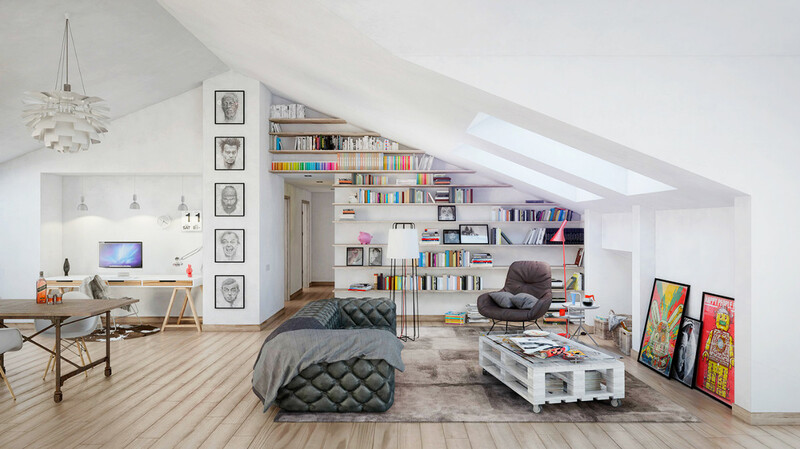 Narrow book shelving won’t cause a huge subtraction of floor space from the room. 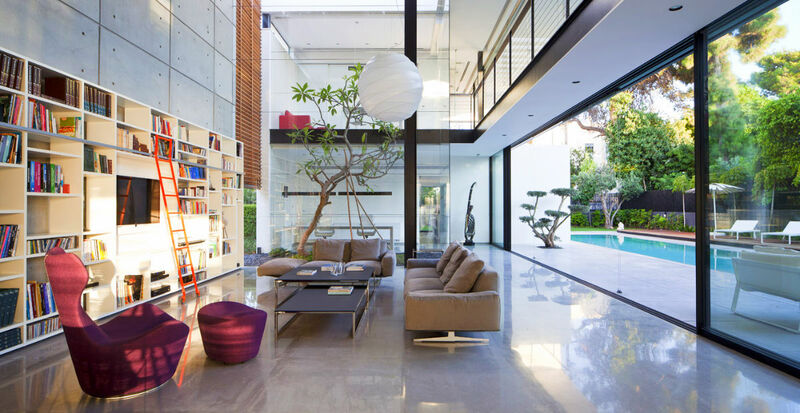 You can soften the look with the placement of some decorative leafy indoor house plantsplant stands for added interest and to differ heights. A bookcase can even be built to your own bespoke design by specialists. You could create a surround in which to hang your TV, for when you’re done with your reading. Don’t forget to install a librarians ladder for those high spots on your set of unique wall shelves too. These three art prints, mounted in front of the bookcase, break up the bank of books and create depth to the display. 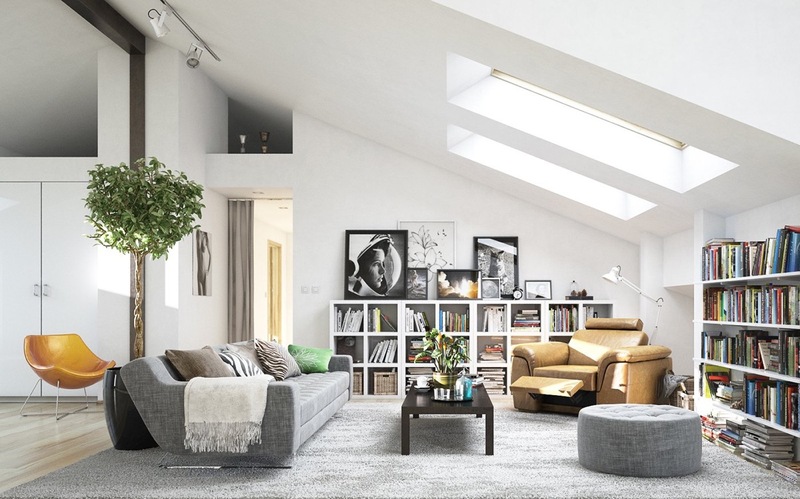 Try hanging your own collection of art prints on the outer edges of your shelving for a new look. 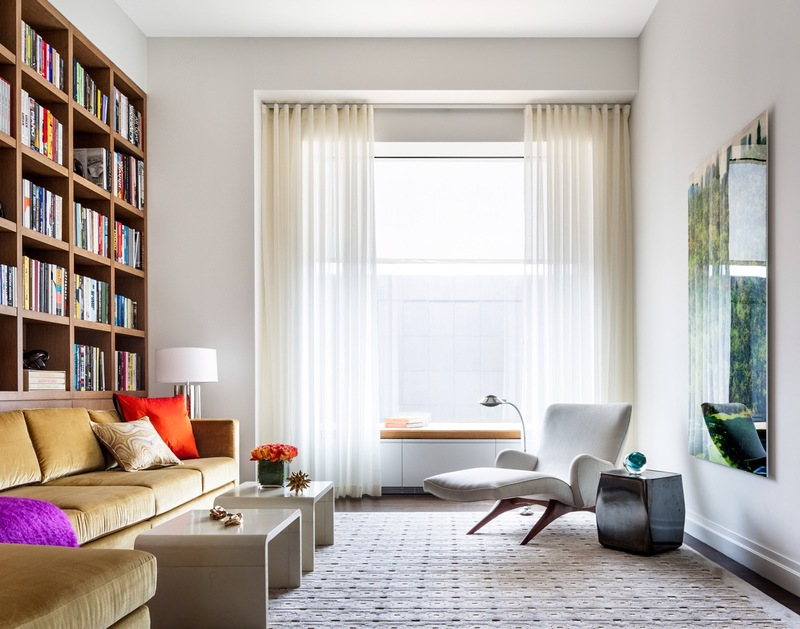 This option also allows for you to enjoy your gallery without compromising on storage space, as you can still house many of your books behind the beloved artwork. 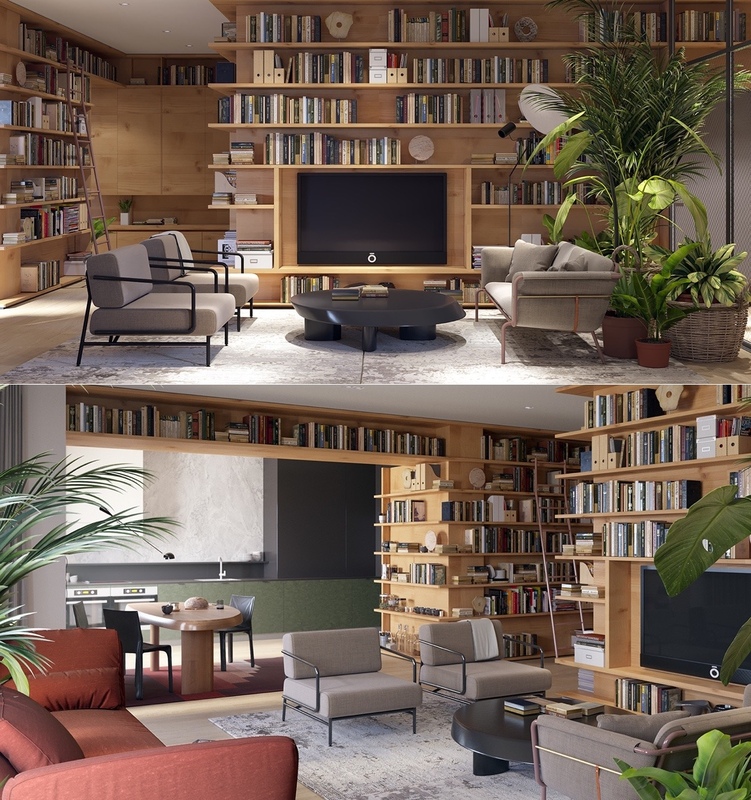 Many people might think that they simply don’t have space in their living room for a large home library but try considering every single available space. 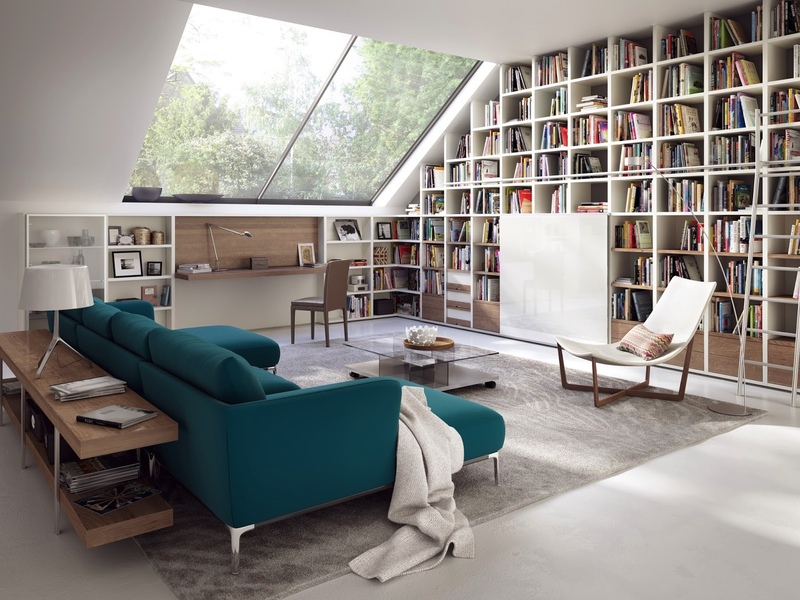 Look vertically and don’t forget that the narrow gaps between things, like windows, can provide ample book storage space. 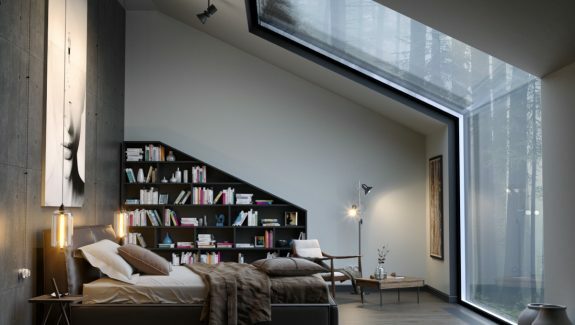 A bespoke bookcase can be built right into the eaves, a great option if you are living under sloping ceilings. Strategically placed table lamps create various spots for reading. 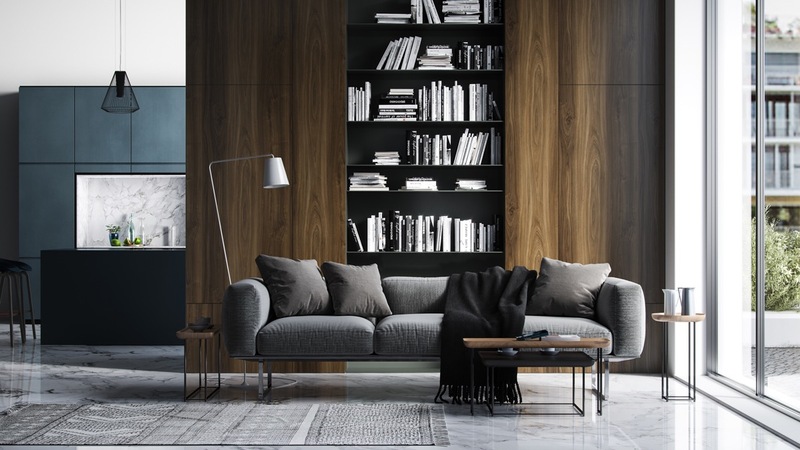 If you don’t have the spare cash for a bespoke bookcase then there are many great floating or freestanding options like these IKEA ones adorning Scandinavian living rooms. If you have a bit of solid DIY knowledge you could even install your own to fit an unused awkward space in your home. 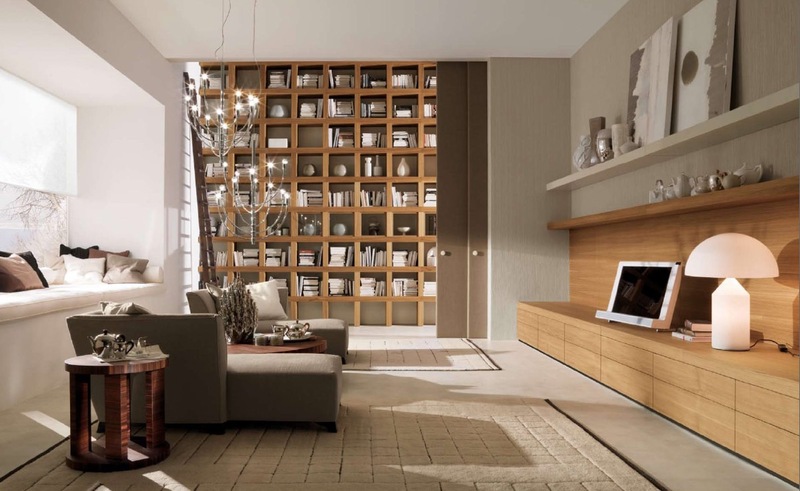 This towering bookcase gives great depth, interest and warmth to a long pale room. 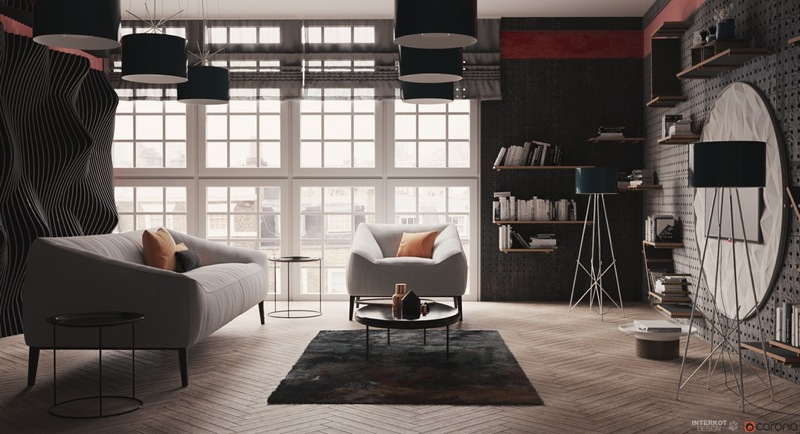 The books create a beautiful feature wall, just as patterned wallpaper or wooden panelling might do, whilst also having the added benefit of being useful. 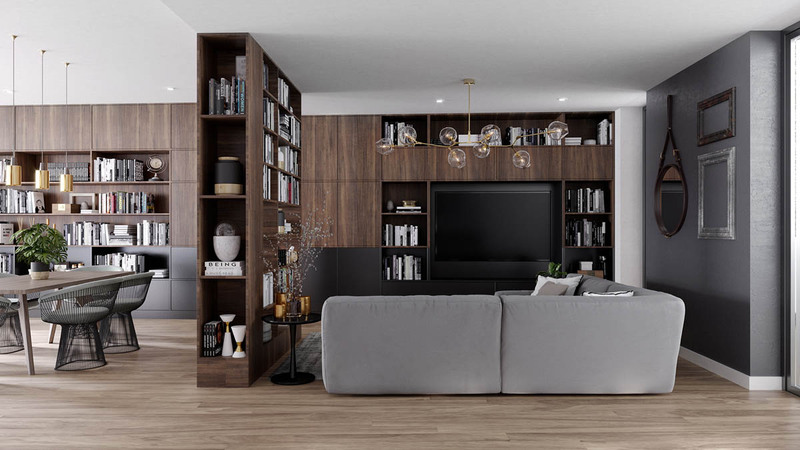 A bookcase can also create a handy and attractive floating dividing wall to section up a particularly long room, zoning one area from the next. In this living room library we see artifacts and treasured keepsakes peppering the bookcase to break up the sea of books. 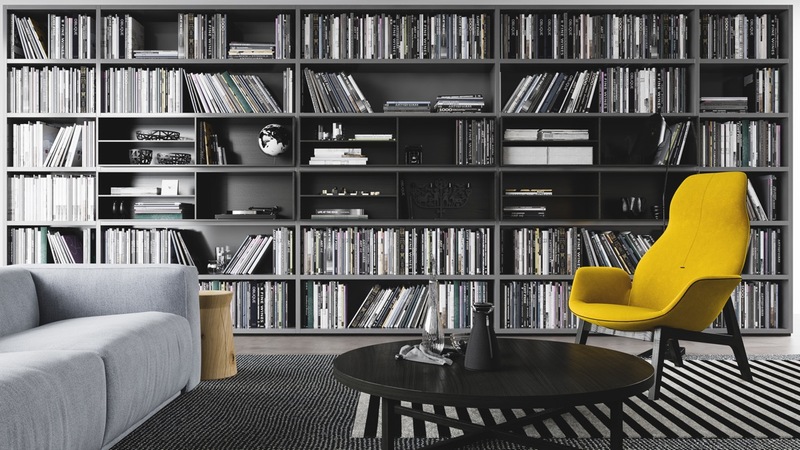 A dark gray shelving system creates a sophisticated look. 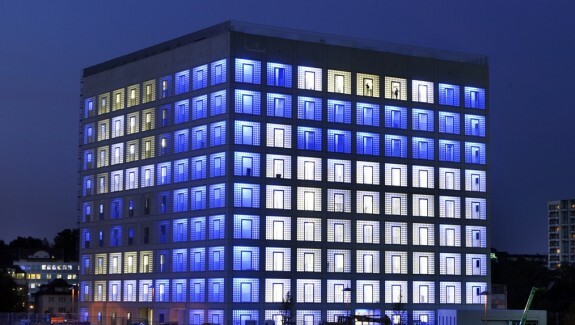 Clever LED lighting can transform the look of your library shelving arrangement. 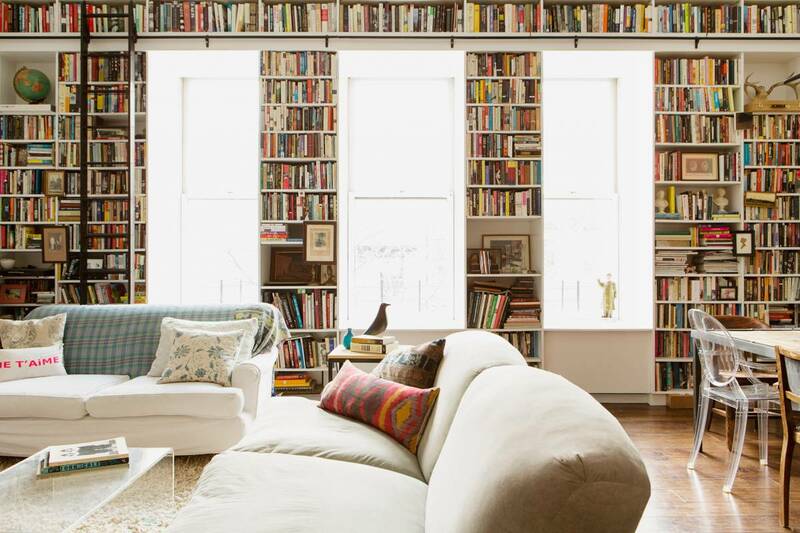 You could pick out just your decorative items from your home library wall. A decorative panel has been used to link two bookcases together in this living room decor scheme. If you’d prefer not to have all of you books on display, doors can be used to partially screen your collection. 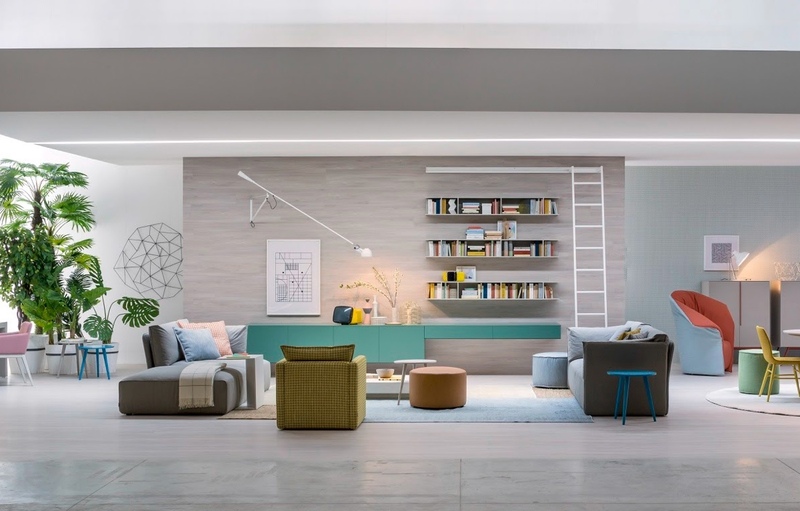 Beyond the opal glass Atollo Desk Lamp in this living room we can see sliding doors have been drawn back to reveal a complete library. 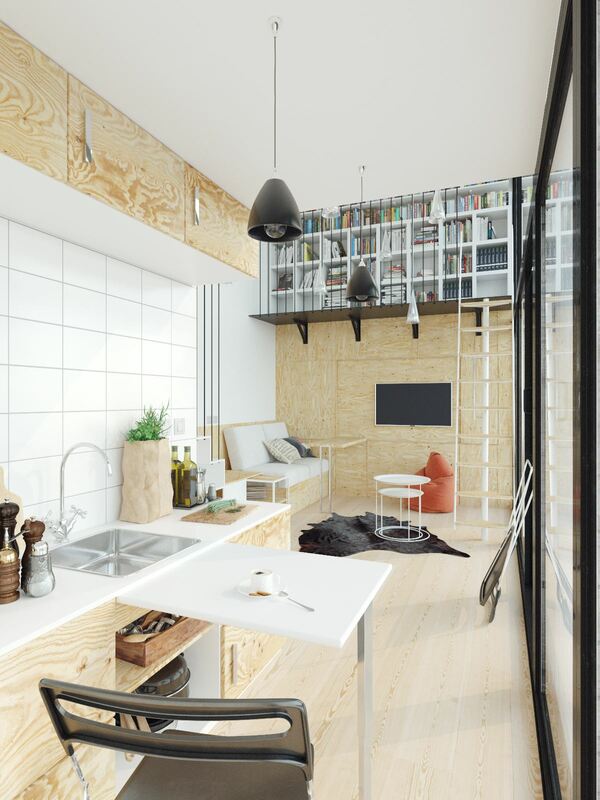 A small mezzanine library has been created in this tiny home. Love those nesting coffee tables! 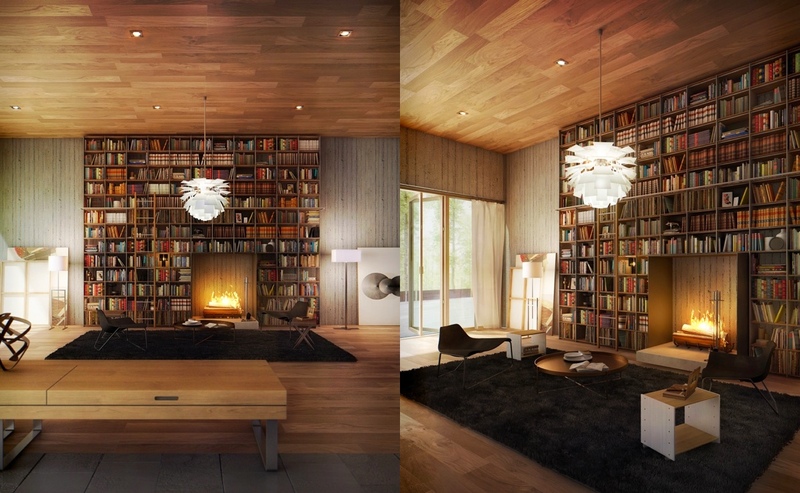 High ceilings allow for tall bookcases. Three rows of wooden bookcases have been used to fill the vertical space in this example. 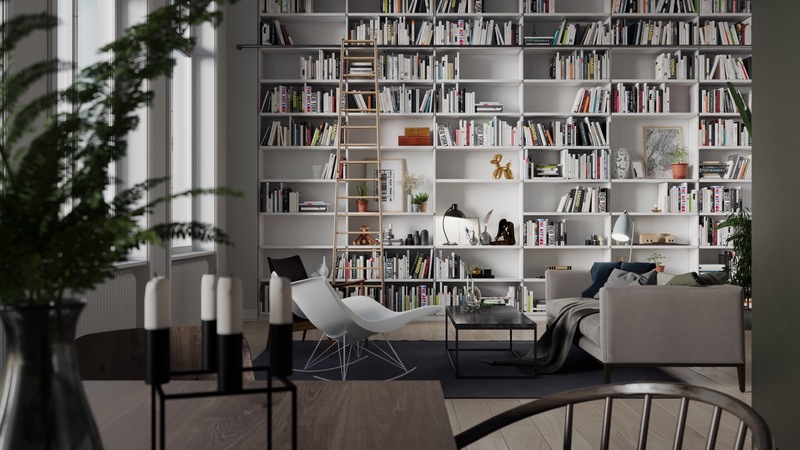 A white bookcase can help keep the book wall looking light. Book shelves don’t have to run end to end; interesting shapes and cubbies can be created. There’s no room for knick-knacks and vases amongst this vast book collection! 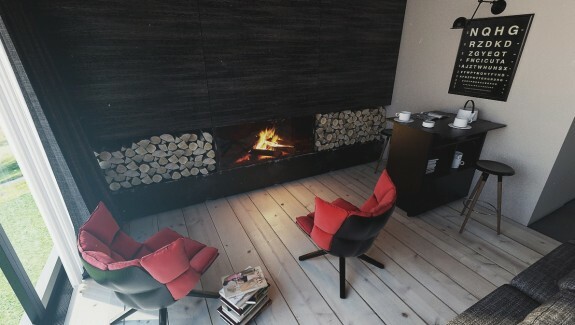 What’s cozier than a book by a roaring fireplace? 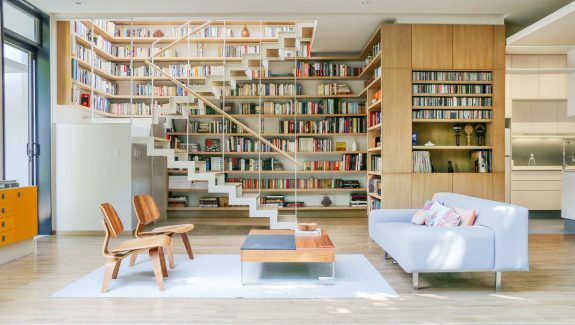 In this industrial home decor the metal staircase works alongside a librarian’s ladder. 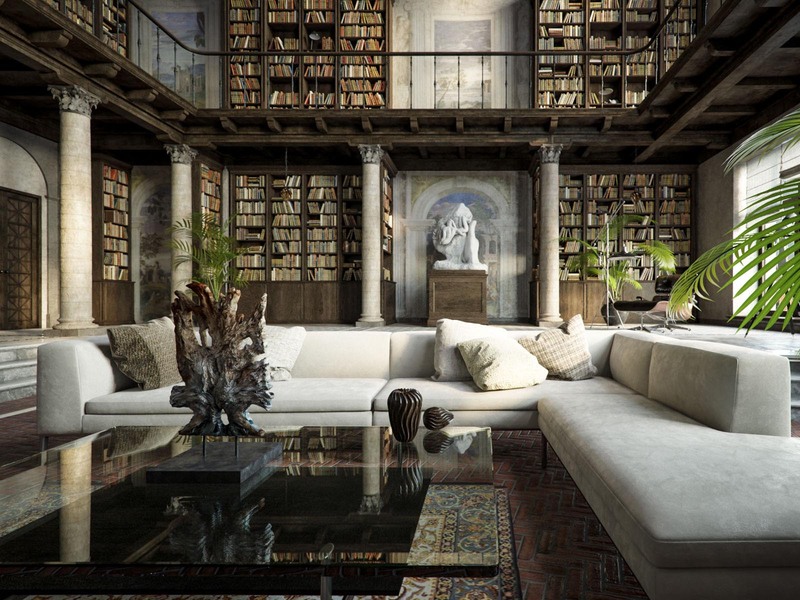 A unique coffee table provides a place to stack your reading selection. Another example of zoning using a bookcase. 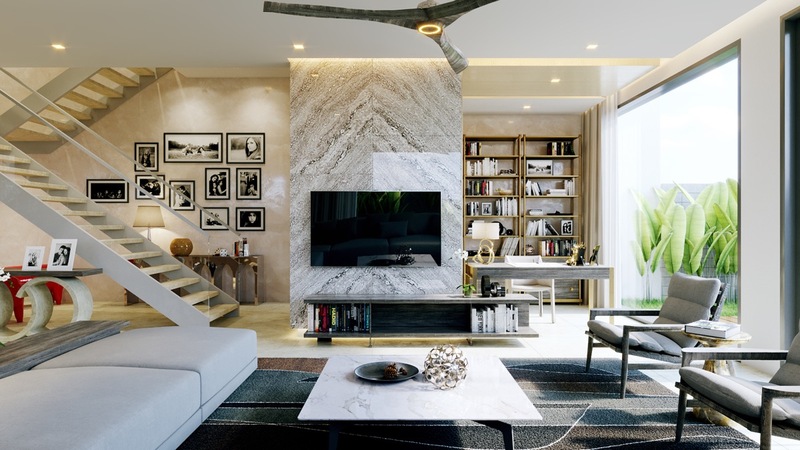 Unique floor lamps are strategically placed to light up this adjustable shelving wall. An alcove is an ideal spot for a book wall. This unique ceiling fan provides an extra light source to aid easy reading. 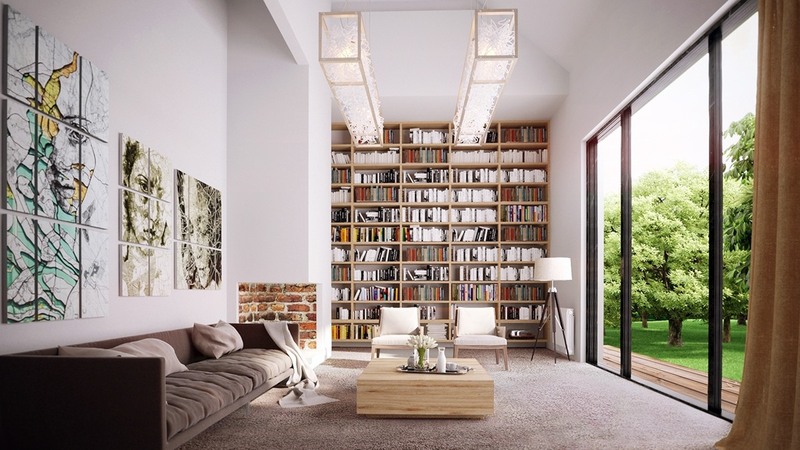 The Flos Mod 265swing arm wall lamp appears to direct you toward the floating book shelves. 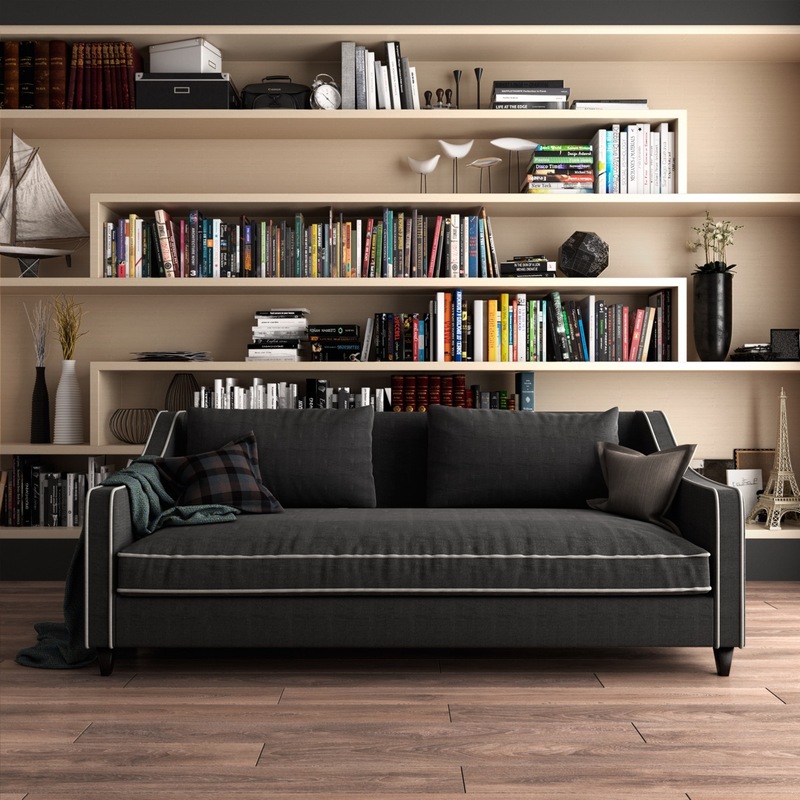 Along with ample shelving and lighting, comfortable reading chairs are an absolute must. A comfortable armchair provides a great spot to perch. A window seat makes an ideal reading nook. A swing arm wall lamp ensures good illumination for night time reading as well.